Imelda Schweighart, the Philippine entry to the Miss Earth International pageant will be returning her crown. This is according to Miss Earth organizer Lorraine Schuck in an interview. Schuck revealed that the mother of Schweighart has decided that her daughter give up the title and the decision was made. 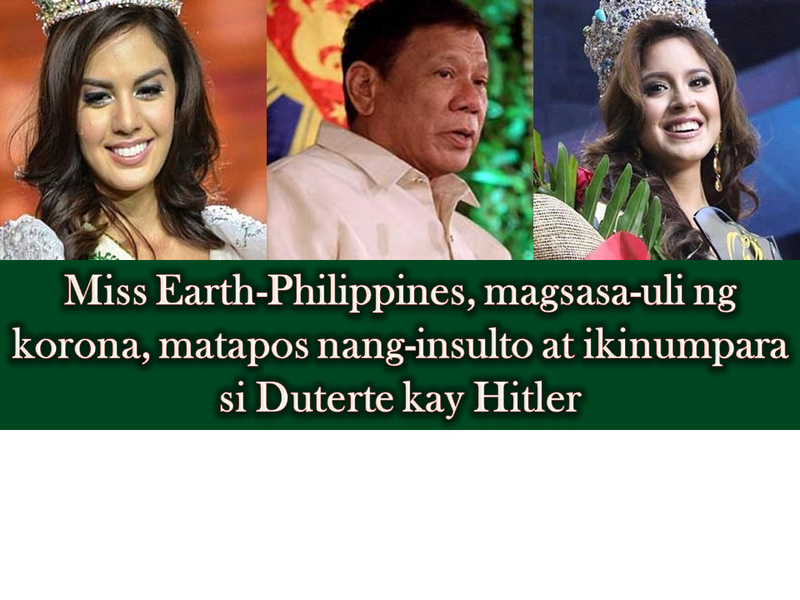 This is an effort to diminished the bashing of the pageant winner after a video of her criticizing the newly crowned Miss Earth 2016 Katherine Espin from Ecuador. “Yung nanalo, peke ilong, peke pa baba, peke pa (as she points to chest). Miss Earth, dapat natural ‘di ba?,” This was the word of Schweighart in front of her fans last October 29. She did not mention the name of Espin in the viral video but observers believed she was alluding to the Ecuadorean beauty queen. Schweighart already apologized to Espin saying she did not mean to offend Miss Ecuador. Early this month, she also stirred controversy when she compared President Rodrigo Duterte with Hitler. “Oh my God, our president is doing Hitler stuff here in the Philippines,” the 21-year-old student said in a Facebook Live video chat. She has since apologized for this incident. Schweighart is 21 years old and a theater arts student. On the other hand, fashion designer refutes Imelda Schweighart's claim about Miss Earth gown fiasco.